Pink salmon occasionally interbreed with chum salmon. Some people call the resulting fish “chumpys”. Pink salmon are the smallest of the Pacific salmon found in North America weighing on average between 3.5 and 5 pounds, with an average length of 20-25 inches. As with all members of the salmon family, pink salmon are coldwater fish. They are also the most numerous Pacific salmon and have been harvested and canned commercially in Alaska since the late 1800’s. Young pink salmon are completely silver without any dark vertical bars or spots. In the ocean, adults are bright greenish-blue on top and silvery on its sides. They have very small scales and pink flesh. As adults get closer to returning to fresh water, they develop a lot of large black spots on their back and all over their tail. 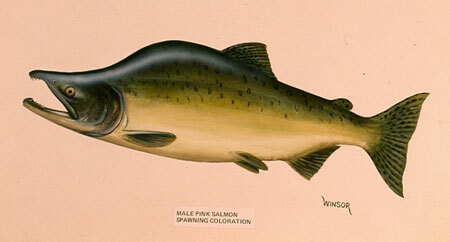 When pinks approach their spawning streams, males turn brown to black on their back with a bright white belly. Females have a bright white belly but turn an olive green with dusky bars or patches that can be lavender or a dark gold. By the time males enter the stream where they will spawn, they have developed a very large hump, and hooked jaws called a kype. Pink salmon have the shortest lifespan of all the Pacific salmon found in North America. They mature and complete their entire life cycle in two years. This predictable two-year life cycle has created genetically distinct odd-year and even-year populations of pink salmon. Fish coming in odd years are unrelated to the individuals returning in even years. Odd-year and even-year populations do not interbreed with each other even when they return to the same spawning grounds. Many times individual streams will tend to have one of the populations (odd-year or even-year) producing more fish. However, in some streams both odd and even years produce about the same number of pink salmon. Occasionally this will shift, and the previously weak year will become the most abundant. As soon as pink salmon fry emerge from the gravel on the bottom of the river, they swim to the ocean. Once there, they begin feeding plankton, larval fishes, and occasional aquatic insects. After 18 months of feeding and growing in saltwater, they reach maturity and return to the river they were born to spawn between late June and mid-October. Males develop the enormous hump on their back, and an enlarged head with big teeth which they will use in fights with other males. The female picks a suitable nesting place and constructs a nest in the river bed by turning on her side and vigorously flexing her body and tail, digging a shallow hole. As she settles into the hole to deposit her eggs, a male joins her to fertilize them. A female may dig and lay eggs in up to four nests, covering her previous nests as she digs new ones. A group of nests is known as a redd. A female stays and defends her redd until she dies, usually within two weeks. Males leave to try and fertilize other eggs. The eggs incubate over winter and hatch in late winter or early spring. The young salmon fry, or alevin, live under the gravel feeding off the yolk sac attached to their belly and continue to grow until they are large enough to emerge and travel to the ocean. Since young pink salmon migrate immediately to the ocean, they generally do not eat as they leave freshwater. For the few populations that spawn much further up large rivers, young pink salmon may eat aquatic insects as they travel to saltwater. In the ocean, pink salmon feed on plankton, other smaller fish, squid, and the occasional aquatic insect. The tiny marine crustaceans pink salmon eat are what give their flesh its pink color. As with all members of the salmon family, when they return to freshwater to spawn, they stop eating. Pink salmon generally spawn in small rivers near the coast, and in estuaries near the mouths of rivers. Most pink salmon do not travel farther than 40 miles up a river to spawn. However, in Alaska they have been known to go greater distances in larger river systems, such as the Yukon, Kuskokwim and Nushagak. In Southcentral Alaska, pink salmon have been documented going as far as 130 miles up the Susitna River. On the Mulchatna River, pink salmon have gone as far as 250 miles upstream before spawning. After young pink salmon emerge from the gravel and migrate to saltwater, they gather in schools and remain in estuaries and along the beaches. Eventually, they begin spending more time feeding in the deeper offshore waters, such as the Gulf of Alaska and Aleutian Islands. 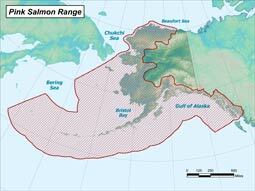 Pink salmon are found along the Pacific rim of Asia and in North America. There are naturally occurring pink salmon populations throughout the coastal waters of the North Pacific Ocean, Arctic Ocean and nearby seas. While pink salmon in North America have been found as far south as north-central California, they do not reproduce in significant numbers below the Puget Sound in Washington State. They occur to the west from the Lena River in Siberia and as far south as Korea and Kyushu, Japan. From the 1900’s through the 1970’s, attempts were made to transplant pink salmon across northern North America, the waters of northern Europe, and as far south as Chile. Most of these efforts have not been successful. An accidental introduction to Lake Superior in 1956 survived and became an established population, spread throughout the Great Lakes, and remains today. This population is the first known population to complete its entire life cycle in fresh water has the only known occurrence of three year old pink salmon. In Alaska, pink salmon are widely distributed along the coast, with only a few in the Copper River delta and none in the upper Copper River drainage. One threat to pink salmon is overfishing. Commercial canning and salting of pink salmon in Alaska began in the 1800s and expanded steadily until about 1920. During territorial days, commercial fishermen used fixed and floating fish traps to extensively harvest pink salmon. A push to ban such traps helped propel Alaska to statehood in 1959. Runs declined markedly during the 1940s and 1950s; however, intensive efforts were successful in rebuilding those runs, and enhancing them through hatcheries to take pressure off of wild stocks. Now most pink salmon are taken with purse seines and drift or set gillnets. Lesser numbers are taken with troll gear or beach seines. Other threats to pink salmon include habitat loss or degradation, particularly to their spawning grounds as they prefer shallow areas with moderate to fast water current and clean gravel with little silt or mud. Climate change may also reduce the availability of their prey in the ocean. Adults returning to spawn do not eat. Young salmon migrating to the ocean may eat aquatic insects and zooplankton. Plankton, marine shrimp and krill, other smaller fish, squid, and the occasional aquatic insect. Anything larger than them including killer whales, bears, birds, and humans just to name a few. A female lays between 1,200 and 1,900 eggs during spawning June through late October. Eggs incubate over winter for 5-8 months and hatch in late winter or early spring. Fry migrate to saltwater as soon as they emerge from the gravel. They feed for 18 months in the ocean, and return to spawn and die at two years of age. The Alaska Department of Fish and Game manages pink salmon in fresh waters of the state and in saltwater up to 3 miles from shore.